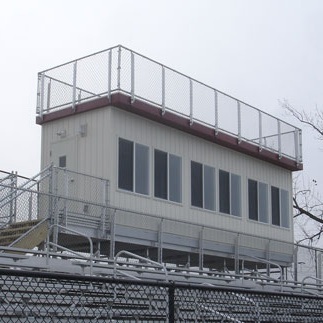 MODULAR SOLUTIONS FOR YOUR PRESS BOX AND ATHLETIC COMPLEX NEEDS. Lake Travis’ expanded multi-level press box was finished 50% faster than traditional construction methods. American Press Box was chosen to provide press boxes to LA Memorial Coliseum: USC while they undertook a total renovation. This is one of the smallest 2-story Ground Game™ Series press box solutions we’ve had the privilege to provide. This all-aluminum portable viewing/scoring stand is a versatile product to help meet space and budget restrictions. It’s on wheels, so is easily transportable to different locations and/or events—inside or outside! SIZE: 5’4”W x 8’L, elevated 2’4” above grade. Railings are 42” in height with a shelf on top of the front rail. Seats 4 people. WE ARE PROUD TO PROVIDE HIGH QUALITY, ECONOMICAL SOLUTIONS FOR PRESS BOXES, SUITES, & CONCESSION STANDS FOR COLLEGES, HIGH SCHOOLS, & MORE. With American Press Box, you can get savings of up to 30%. American Press Box (APB) is a leading supplier of press boxes, VIP suites, and concession stands for high schools and colleges throughout the US. Our turnkey process for adding a press box to any new or existing grandstand allows for fast turnaround from design to installation—at costs well below the market. Our design and install process eliminates architectural and engineering costs typically required to build a press box on-site, and those savings are passed on in full to our customers! American Press Box has provided winning solutions to meet the budget and functional needs of schools and facilities of all sizes. From small, efficient, elevated and 2-story press boxes to multi-unit mega press box complexes, no project is too small or too large. Every project matters, and every project stands to benefit from our modular system and expertise. That’s right! Let American Press Box show you how you can incorporate a concession stand, storage, and/or restrooms into your press box plan—for the cost of a typical single-story elevated design. Check out our Ground Game Series™. Our standard press box designs include everything you need to have a fully-functional press box complete with a finished interior, electric, heating, and counter tops. Our full list of options can transform a standard design into a customized facility that meets your specific functional needs and cosmetic preferences. Adding a VIP Suite or “Sky Box” to a grandstand is becoming a viable option for many high schools. APB will gladly show you how you can add suites to your press box facility and begin to add significant dollars to your revenue stream. When you are considering adding a press box, VIP suite, storage building, concession stand, restroom facility, or ticket booth to your grandstand complex, choose American Press Box to add value to your project. Our quality, price savings, and personal interest and service will make the project enjoyable—and the result one you, your supporters, and community will be proud of.